In the former residential building of the Epiphany monastery, between the halls of the Museum of the Belarusian Book-printing, there is an another museum – branch of Polotsk National Historical and Cultural Museum-Reserve – the Museum-library of Simeon of Polotsk. It is decorated in the traditional manner of the interior of a medieval West-European library: there are two-level wooden bookcases, busts of scientists and philosophers, a reading room and a globe in the center of the hall (the biggest in Belarus). The artistic setting of the exposition was realized by designer I.Kurzhalov. The exposition of the museum describes different periods of life and activity of Simeon of Polotsk; it dwells on the earliest Polotsk period, the years of studies in Kiev and Wilno and also his life in Moscow. 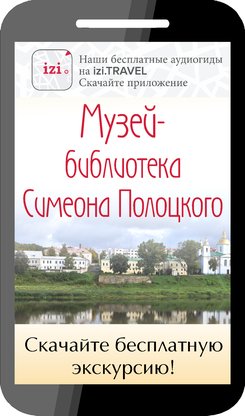 A special emphasis in the exposition is laid on literary and publishing activities of Simeon of Polotsk. The museum showcases display originals of Simeon’s books: “The Warder of Power” (1753), “The Testament” (1680), “The Spiritual Supper” (1683); books of the 17-18th centuries, copies of his manuscripts, figured baroque poems. They also contain contemporary research works devoted to life and activity of the famous son of Polotsk. The museum was opened on the 25th of March 1994. The exposition occupies area of 134 sq. m. 145 museum objects are displayed there. Besides it holds a part of the collection of printed editions and science library fund. There is a reading room with tables for 10 readers. Different presentations, seminars and meetings with well-known poets and writers take place in the museum hall.